I’ve always wanted to play around with Arduino Ultrasound sensor, but the idea of spending 30$ + shipping on a device that I may not use always sounded not that great. 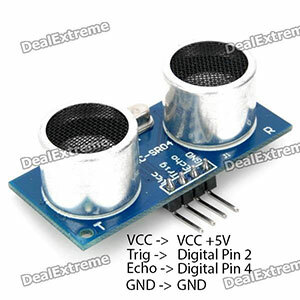 Luckily, Dealextreme.com had a copy version of it, called HC-SR04 Ultrasonic Sensor Distance Measuring Module (Affiliate link) priced at $4.60. Not so bad, shall we try it? The Trig pin will be used to send the signal and the Echo pin will be used to listen for returning signal. The code is fairly straightforward. I took the original example code for Ping))) sensor and just modified the OUTPUT pin to be Digital Pin 2, the INPUT pin to be Digital Pin 4 and trigger duration to 10 us. 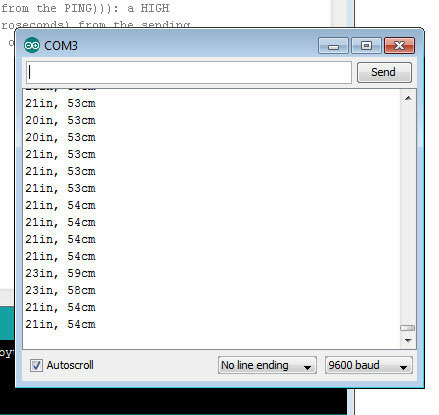 After compiling, uploading and running it, in the Serial Monitor (Tools -> Serial Monitor or Ctrl + Shift + M) the sensor was sending correct data! After a bit of fooling around I found out that the range is approximately 2cm - 300cm. Which is not bad, but not perfect either.